The sixteen children of Jeff Augustus Gus BIRD and Clara Myrtle GRAY, You all are the 2nd cousin three times removed of Ann Pamela Cunningham (1816-1875). In 1853, Ann Pamela Cunningham founded the Mount Vernon Ladies Association of the Union and saved George Washington's Mount Vernon Plantation. Ann was the grandniece of Mark Bird (1738-1812) and Mary ROSS (1744-1790). Ann Pamela Cunningham was the daughter of Colonel, Robert Cunningham (1786-1859). 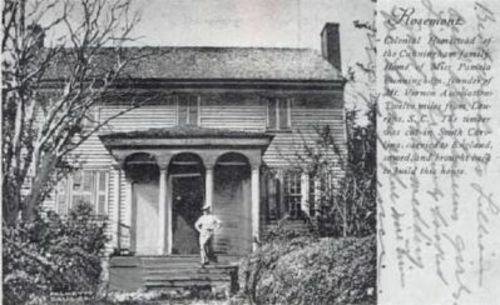 Robert was born on October 18, 1786, at Rosemont Plantation, on the Saluda River, Laurens County, South Carolina. Robert was the son of Patrick Cunningham (1760-1796) and Ann Harris (1765-1799) Robert died on July 7, 1859, at Rosemont Plantation, at age 72. On Feb 22, 1814, Robert Cunningham married Louisa Bird (1794-1873) at Rosemont Plantation. Louisa Bird was the daughter of Colonial, William Bird (1757-1812) and Catharine Dalton (1763-1822). Colonel, William Bird was born May 18, 1757, in Birdsboro, Amity Township, Berks County, Pennsylvania. William was the son of Ironmaster, William Bird (1706-1761) and Brigitte Huling (1710-1792). Colonel William Bird died on May 18, 1757, at Aviary Plantation, Sparta, Warren County, Georgia. Louisa Bird was born in 1794 in Alexandria, Virginia. She died on October 6, 1873 at Rosemont Plantation, at age 79. She was buried in the First Presbyterian Churchyard, Columbia, South Carolina. Colonel, Robert Cunningham and Louisa Bird had one daughter, Ann Pamela Cunningham. Ann was born on August 15, 1816, at Rosemont Plantation, Laurens County South Carolina. 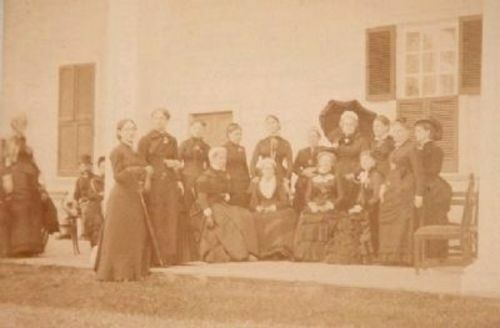 Photo by William L. Clements, Library University of Michigan, circa 1870, of Ann Pamela Cunningham seated at center surrounded by her Mount Vernon Ladies Association of the Union, Board of Regents at Mount Vernon in 1870. Inscription. "About 2½ miles southeast, a granite monument stands on the site of Rosemont, birthplace and home of Ann Pamela Cunningham, founder and first regent of the Mount Vernon Ladies' Association of the Union. Through her efforts Mount Vernon was purchased by the association in 1858, and Washington's home was restored and maintained for posterity." Location. 34° 19.05' N, 82° 3.722' W. Marker is in Waterloo, South Carolina, in Laurens County. Marker is on Greenwood Highway, on the right when traveling south. Click for map. Marker is located at the intersection of Dillard Road and Greenwood Highway (SC Highway 221). Marker is in this post office area: Waterloo SC 29384, United States of America. Rosemont (Man Unknown) Caption to the right reads: "Rosemont: colonial Homestead of the Cunningham family. 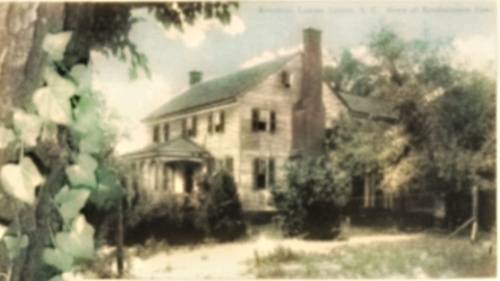 Home of Miss Pamela Cunningham, founder of Mt. Vernon Association. Twelve miles from Laurens, S.C. The timber was cut in South Carolina, carried to England, sawed and brought back to build this house." (Rosemonte Plantation, Rose Monte Plantation) Rosemont, dating from ca. 1790 to 1930, is an excellent example of an Upland, or Piedmont, plantation associated with indigo, tobacco, and eventually cotton production. Archaeological research has revealed that the features and architectural remains associated with the plantation have strong integrity and are capable of providing information on intra-site patterning, subsistence data, refuse disposal patterns, architecture and organization of the plantation, and the display of wealth by the plantation owner. An examination of the associated landscape features reveals that the gardens can still be traced, original plantings are present, walkways are preserved, and the landscape and gardening traditions of the period are evident. Archival research indicates that the development of the plantation was begun sometime between 1750 and 1790. The plantation reached its zenith during the second quarter of the nineteenth century and the main house stood until it burned in 1930. 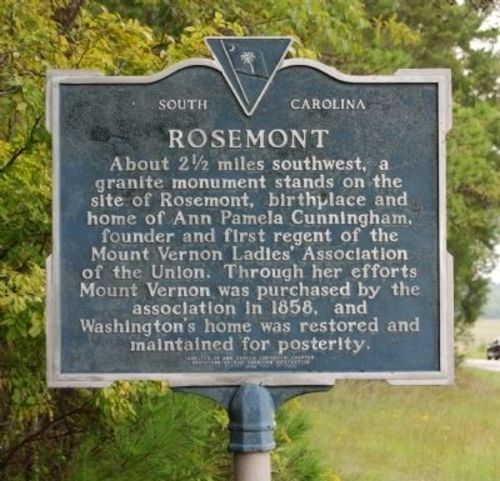 In addition, Rosemont Plantation is intimately associated with Ann Pamela Cunningham, who was born at Rosemont in 1816, inherited Rosemont from her father, operated the plantation through the Civil War, and died at Rosemont in 1875. She worked tirelessly to save George Washington’s Mount Vernon Plantation for the nation, organizing the first meeting to raise funds for the purchase, negotiating with the owners of Mount Vernon, serving as the first Regent of the Mount Vernon Ladies’ Association of the Union, and overseeing the restoration of the house. Listed in the National Register June 11, 1993. Linton Chronicles a publication of the Linton Research Fund Inc.
Bird Chronicles a publication of the Linton Research Fund Inc.